What a convoluted title! Still, the lack of formal elegance might just be compensated for by its communicative efficacy. The aim of the above header is to link two names in people’s minds, both of them Italian: Mario Draghi and Matteo Renzi. Naturally the idea is not original, the FT’s Peter Spiegel recently published an entire blog post ( Does Renzi owe his job to Draghi?) trying to establish some sort of connection between the arrival in office of Italy’s Matteo Renzi and the recent German Constitutional Court ruling – in the process casting the central bank President in the role of midwife. Indeed, according to the FT, Italy itself is currently rife with rumours about what might actually lie behind Renzi’s meteoric rise, and again the role alloted to Mr Draghi seems to be rather more than an incidental one. But this post is not about rumour, nor is it about speculation – beyond, that is, speculation about what the ECB might do in its campaign to keep the Eurozone deflation menace at bay. Rather than conspiracies (real or imagined) it is about coincidences and the role they so often play in shaping events and outcomes. In this sense the fact that Mario Renzi took over the helm of government in Italy just a short time after the German Constitutional Court ruled on the ECB’s Outright Monetary Transactions (OMT) programme has real potential. What we could call Spiegel’s hypothesis suggests the driving force for the “unholy alliance” which may or may not have been forged between Matteo Renzi and Mario Draghi would be found in the latter’s interest in getting prime minister Letta out of office before pressure from within Germany about maintaining open the offer of a legally questionable OMT programme to an Italy which was enjoying cheaper bond yields but was manifestly not advancing with its reform programme became too strong to withstand. Leaving aside the problem of mechanism – how could Mr Draghi or anyone else have stirred up participants in the Italian Democratic Party’s primary election – the potential synergy between the two developments (the Karlsruhe ruling and the new government in Italy) is more than evident. The key part of the background here, as Wolfgang Munchau has already pointed out, is that the German court ruling effectively left OMT – which only ever had a virtual existence and was increasingly seen as an empty bluff since it was clear no one was going to accept the conditionality side – deader than that infamous dead duck. Karlsruhe’s objection to the existing bond buying programme was that it went beyond the ECBs mandate since directly financing government debt is prohibited under Maastricht, and the objective of OMT was to help governments finance at an affordable price. Since break-up risk – which could have offered an alternative justification for OMT – is for the moment off the table, OMT lacks definitive legal justification and in practical terms the emperor visibly has no clothes. It is just a question of how long the markets need to wake up to the fact. Under these circumstances, as one argument would have it, it is only a matter of time before market sentiment turns and peripheral spreads come back under pressure at which point OMT would be tried tested and severely found wanting. While I think this risk to peripheral spreads in the short run is probably overstated (since at this point market participants are so bullish they are effectively immune to flashing red light warning signals), letting Italy simply drift does involve a high level of potential risk, and certainly a higher level of risk than a prudent central banker might want to run. So that part of it I buy: Mario Draghi would be at least rooting for Renzi even if he wasn’t doing anything to actively make his wish come true. But then, enter the deflation threat. 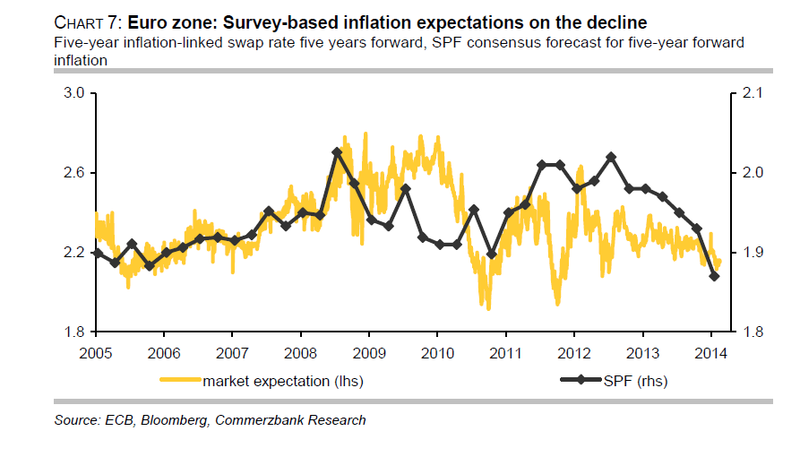 The ECB is – and not without justification (see the above chart showing the movement in 5 year index linked forwards prepared by Commerzbank’s Michael Schubert) – concerned about the possibility that longer term inflation expectations could become anchored well below the 2% price stability level the maintenance of which the ECB does consider to be its mandate. Aggregated inflation across the 18 countries who constitute the monetary union has fallen and remained below 1% for an extended period of time now. In several EU countries prices have actually started falling, in others inflation has dropped to very low levels of 0.5% or below. 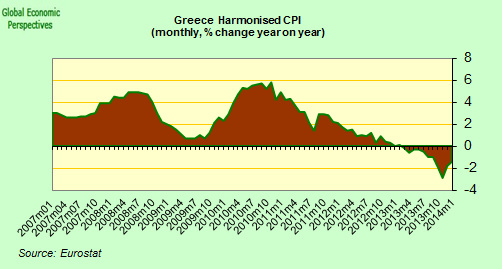 Greek inflation is currently running at an annual rate of minus 1.4% and has been in negative territory for eleven months now (see chart above). Worse still, and again as Wolfgang Munchau points out, there is a real risk that the periphery economies drag the German inflation rate down along with them. “Germany’s federal statistics office said last week that real wages – after inflation – fell in 2013. This was unexpected because other surveys suggested they had gone up. What seems to have happened is profit-related pay and other hard-to-measure components of wages came down last year. So the initiation of some kind of bond purchases programme at the ECB is looking increasingly likely. If such a programme is implemented it will differ from OMT in the justification offered (to try to attain the bank’s inflation objective), the fact that the bank will buy bonds from ALL countries according to their weight in Euro Area GDP, and by the fact that there will be no conditionality attached. Naturally, the fact that they will initiate such a programme doesn’t necessarily mean it will work and achieve its objective. As we can see in Japan, the effectiveness of the policy is questionable, but then a central bank can hardly say, “deflation ahoy, but there’s nothing we can do about it”. Whether or not it is possible to reflate economies which have entered some kind of enduring process of secular stagnation – as Larry Summers obviously thinks you can (or see here) – remains an open question as far as I’m concerned. If part of the problem is demographic – as I explain here and here in the context of Abenomics – then it is hard to see how you can. Possible we need to start to learn to live with deflation and find ways of managing the impact on the financial sector. As the FT’s David Pilling so cogently put it recently in the Japanese context: “monetary policy can’t print babies”, and one day or another as our workforces accelerate their decline it may be hard to sustain positive growth. Maybe there are some realities looming out there that we are just not ready or able to accept yet. But, going back to Renzi, the initiation of sovereign bond purchasing type QE will surely mark the beginning of a Japanese turn in ECB policy. It may start with just 400 billion, but it could then grow and grow, especially if the structural weakness in domestic demand continues to exert a downward pressure on prices even despite the money printing. So just who might benefit from this? Well, you don’t have to be excessively astute to see that Italy would be prime candidate. The country currently has a gross government debt to GDP ratio of around 135%, small when compared to Japan’s level of nearly 245% but still it is large and rising, especially if Italy continues to push on its fiscal deficit limits. And they will need to do this since there are no signs that the country’s economy – like its Japanese equivalent – can grow any faster than it did before the global crisis without ongoing fiscal stimulus. Pushing the debt upward much beyond the current level without being forced into some kind of debt restructuring would seem to be be virtually impossible, unless……….. unless the ECB start to buy the bonds. 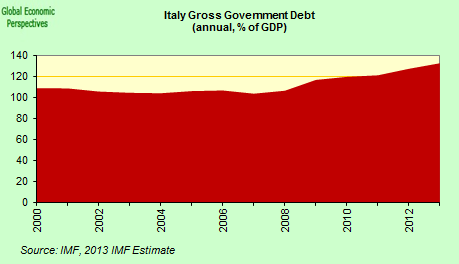 So could Matteo Renzi, who doesn’t seem especially worried by the size of Italy’s public debt levels be just the man for the job? The key to the new win-win strategy would lie in the Renzi’s aim getting agreement to increase the country’s fiscal deficit (rather than as previously lowering the bond spread) in exchange for structural reforms. Basically any ECB Italian bond purchasing would ease pressure on Renzi in the short term. Mario would “have Renzi’s back” provided he complied with the reforms. And if he didn’t, well then more than likely he would simply go the way of Enrico Letta.